Percheron heavy horses, originally known as Norman Percheron, are one of the best-known European horse breeds. They originated in the district of Perche, to the north and west of Normandy in France. They never achieved the popularity in England of the Clydesdale and Shire heavies, and although quite a number were imported into Britain – especially in the late 1800s – they were believed not to have the strength and stamina of the British breeds. However, the Percheron found favor in the United States as a heavy draught animal, but a good deal of its popularity there is believed to have been due to its predominant grey color. 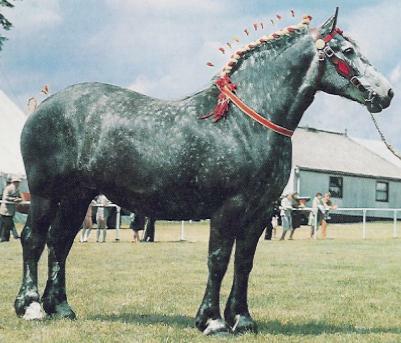 Percheron horses are more like Suffolk horses than other British heavy breeds, especially in the lack of feathering on its heels.